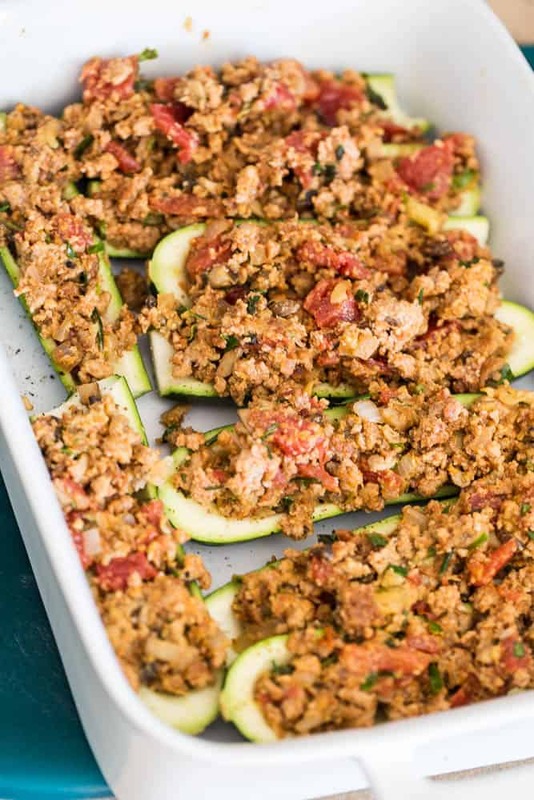 This Italian Paleo Stuffed Zucchini with Turkey Sausage recipe has been updated to be pale0 & Whole30 friendly! 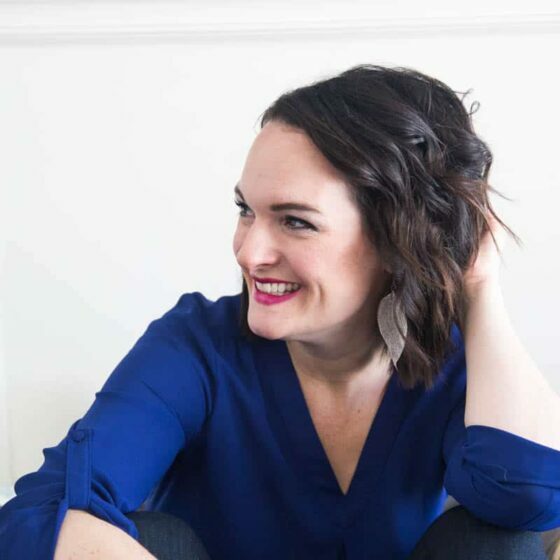 (6/20/17) I love updating these old posts because I’ve seen how much I’ve grown as a photographer and a recipe writer. 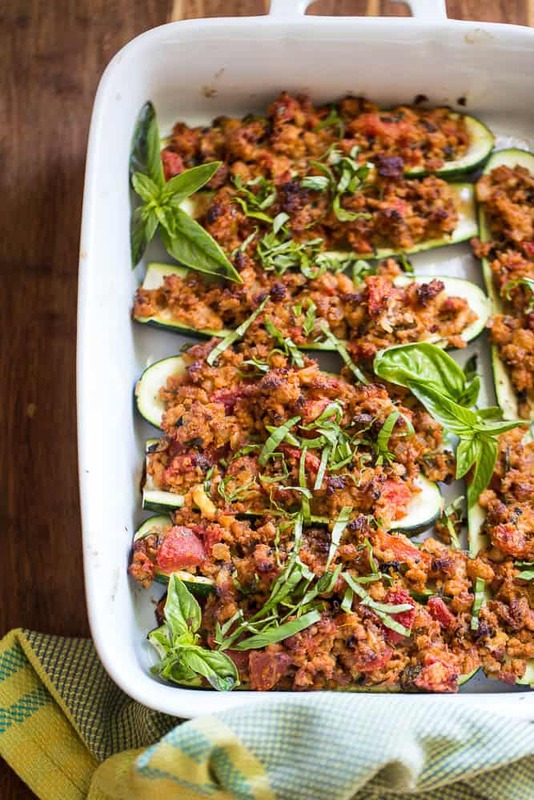 I chose this Italian Paleo Stuffed Zucchini post in particular because the photo in the post (yes, just one) was horrendous and for some reason a lot of people felt it to be worth of pinning on Pinterest. I really didn’t want that to be the first impression someone has when they come to my site. It’s like having guests sneak into your house through your cluttered garage instead of going through the front door into the room you actually cleaned. Does that make sense? It makes sense in my head. This recipe was originally from Simply Recipes, and it’s been here for almost 8 years. 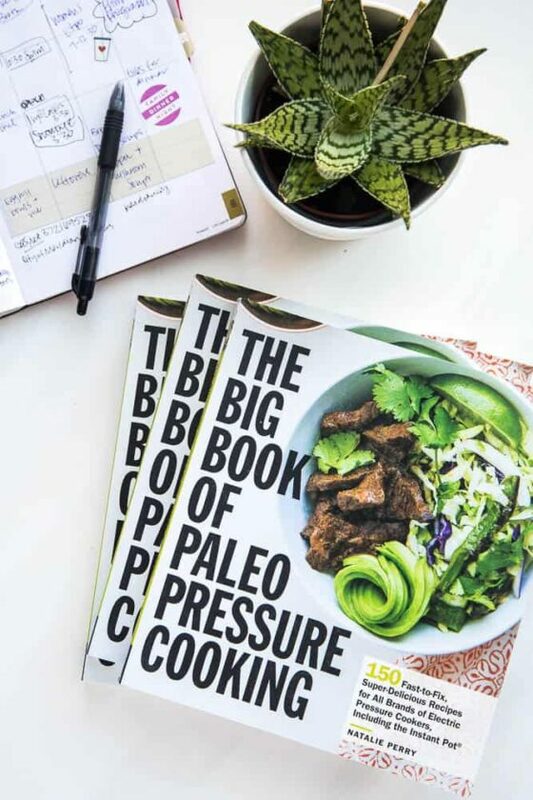 I decided to give it some paleo/Whole30 tweaks and refresh it. When I made it again, I was holding my breath as my kids tried because none of them like zucchini. It’s a summertime tragedy, really. I get so excited to throw summer vegetables on the grill and Steve and I are the only ones who eat them. Sigh. They’re more inclined to eat raw vegetables, though, which I’m not complaining about. Overall they’re pretty good eaters. I can get them to eat salad, so I shouldn’t complain much. At our house, we always take a bite of something new. If we don’t like it, we don’t have to finish it, but mom doesn’t make you a second dinner. She’s pretty much through being in the kitchen by dinner time and isn’t a short order cook. They all tried it. They all loved the filling. Two of them actually ate more of the zucchini (whoop!). I call that a win. I snickered to myself because there’s actually zucchini in the filling, too, but none of them realized it. Sneaky, sneaky. Paleo Zucchini Flatbread — a gluten and grain-free version of flatbread. You can use this as a pizza crust, a replacement for naan bread or tortillas or to make sandwich rolls! Pesto Zucchini Noodles with Broccoli & Bacon — This is one of the most popular recipes on my site! Zoodles + bacon is amazing alone, but add some pesto and BOOM. So good. Marinated Grilled Zucchini — Grilled zucchini is super good, but have you ever tossed it in a vinaigrette and fresh herbs when it comes off the grill? Thai Green Curry Zoodles with Shrimp — Here’s a quick summer recipe that’s perfect for when you don’t want to turn on the oven. Here's a great use for all of that zucchini spilling out of your garden at the end of the summer! 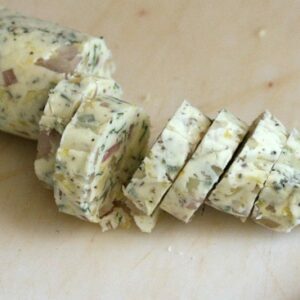 I love the addition of fresh herbs and the "cheesy" taste the nutritional yeast adds! 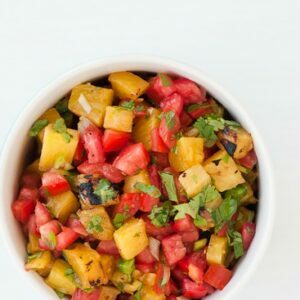 You'll love this paleo and Whole30 friendly meal. Cut all the zucchini in half lengthwise, and using a spoon, scoop out the centers leaving a 1/4-inch thick shell. Reserve the insides you just scooped. Heat 2 Tablespoons avocado oil in a large skillet over medium-high heat. Add the onion, garlic, mushrooms, and reserved zucchini insides. Cook, stirring often, for 6-8 minutes until the onions and mushrooms are soft and any juices from the pan have cooked away. Transfer the contents of the pan to a bowl and set aside. In the same skillet, add another Tablespoon of avocado oil and bring it to high heat, but not smoking. Add the ground turkey. Cook, stirring occasionally, until the turkey has formed crispy browned edges and is cooked thoroughly. 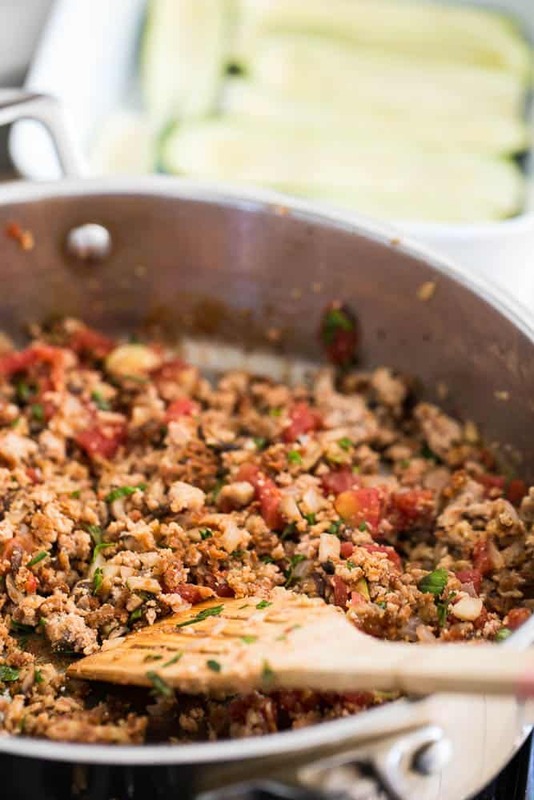 Return the reserved vegetable mixture to the skillet with the turkey. Add the broth/water, scraping the browned bits loose from the bottom of the skillet. Remove the skillet from the heat and let it cool for a couple of minutes. Add the tomatoes, thyme, rosemary, nutritional yeast, egg, salt, and pepper to the turkey mixture. Mix well to combine. 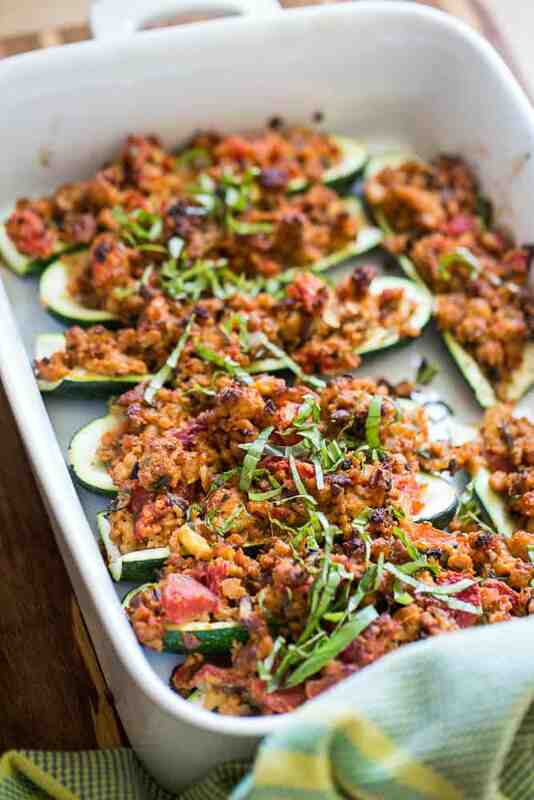 Arrange the zucchini shells in a 9x13 or larger baking dish. Spoon the turkey mixture into the shells, pressing to get as much filling in as possible. Bake for 40 minutes, until golden brown and the zucchini is tender. If the turkey begins to brown too quickly, tent the pan with a piece of aluminum foil. Remove the pan from the oven and sprinkle the chopped basil over the top. Serve while hot. Hey cool! I didn't know you had this blog too. I've been looking for a recipe to use the Ground Turkey in the freezer. This one will also help me get rid of some zuchinni- double bonus. Hey there! I made this recipe last night, and overall, it was quite good. Unfortunately, it was waaaaay too much pepper. I actually came back to see if anyone else had commented on this. I love pepper, but this was cough-inducing. I will definitely make this again, but with probably 1/2 to 1 tsp pepper. Thanks for the recipe! You’re so right. I think 2 teaspoons is way too much, too. I think that may be a typo (It’s been so long since I’ve made this I honestly don’t remember!). I’ll reduce it to a 1/2 teaspoon. Thanks for catching that! It only calls for 1/2 t. Pepper. Should I cut it lower then that? I’m not a pepper fan. Made this tonight… made just a few changes. Did have mushrooms so i added chopped green pepper instead. I also put the zucchini in the pan with water and microwaved it for 5 minutes so that it would cook bake quicker. I them emptied the water from the pan, put some no salt added tomato sauce in the bottom of the pan, mixed some tomato sauce with the turkey mixture and baked as the instructions suggested. It felt like the reciped needed something else, tomato sauce did the trick! It was SO yummy. Thanks for the great idea! 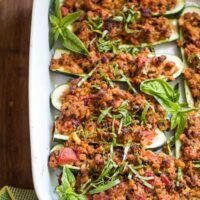 My family and I love zucchini, so please feel free to continue sharing these delicious recipes… this was absolutely delicious! My 22 month old twins loved it, so I’m a happy mommy, not to mention it’s a tasty and healthy meal for my mother, who has metastatic breast cancer. I have made big changes in our family’s diet, trying to instill good eating habits in the twins so they’ll eat wisely always. Thank you for this amazing dish. Did this tonight with a few changes. Also didn’t have mushrooms and used green peppers. I added the salt and pepper to taste while the ingredients were cooking. I also used thyme and parsley as my herbs because I had to work with what I had. I did not have an egg or parmesan so I used a scoop of cream cheese. The flavor was great and the end result was great. Yay for substitutes! finding this matter to be actually something which I believe I would never understand. Great recipe but am I suppose to eat the whold zookeeny? I did and not sure I am feeling ok now. I found this on pinterest and it was delicious!! I did red peppers instead of tomatoes and I’ll cut the salt in half next time but to each their own! It was super yummy!!! Thanks! I made the recipe exactly only I did half ground turkey and half mild sausage. Then just before done added a little Monterrey jack cheese on top. This was awesome. i really liked the idea of this recipe, however, it’s just too time consuming for me. Maybe the zucchini could be baking while cooking the ground turkey mixture? I feel like I did lots of work and then still had to wait 40mins to get to enjoy it. Hungry kids were not impressed with waiting. I’ll try it again with cooking the zucchini at the same time as the filling. I’m confused as well. Looking at the amount of meat though, I think that the 1 long one wouldn’t be enough but 6 mediums would be. Glad I’m not the only confused one though! This recipe was absolutely delicious. I have shared it with family and friends (which I don’t do lightly). I could eat this for every meal if I had to. Thanks for the great recipe!! So good to hear that, Sherry! Thanks! I’m glad you enjoyed it. 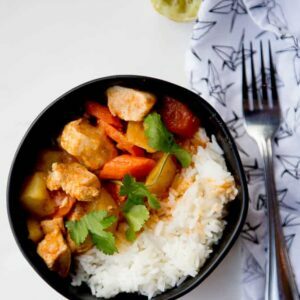 Pingback: 21 Easy Turkey Recipes for Healthy Meals - Skinny Ms.
Hi. I used to have the old version of the recipe and have since lost it… and now I’m sad that I can’t get it… do you have the old version available as well? I’ll try this one, but would like to have the old one too! You can get to the original version by clicking over to the Simply Recipes link within the post.